Male; Candidate must at least Vocational graduate; Must have at least 1 year experience as Warehouseman; Must be physically fit; With good moral character; Willing to learn and be train. Female; College graduate of College level; With experience in the same field. Female; BS Accountancy graduate; With experience in the same field. Female; Graduate of any Business course; With 1 year experience; Proficient clerical skills; With ability to follow both good oral and written instruction; Have high attention to details; Willing to work under pressure with minimum supervision; Highly organized and trustworthy. Male; With good moral character; At least one(1) year work experience in related field; Must be willing to work on shifting schedules; Knowledge in preparing Filipino cuisine and butchering; Well verse in planning menus, establishing size of food portion; Exceptional understanding of preparing food for cooking; Highly experience performing food quality inspection to ensure quality standards. 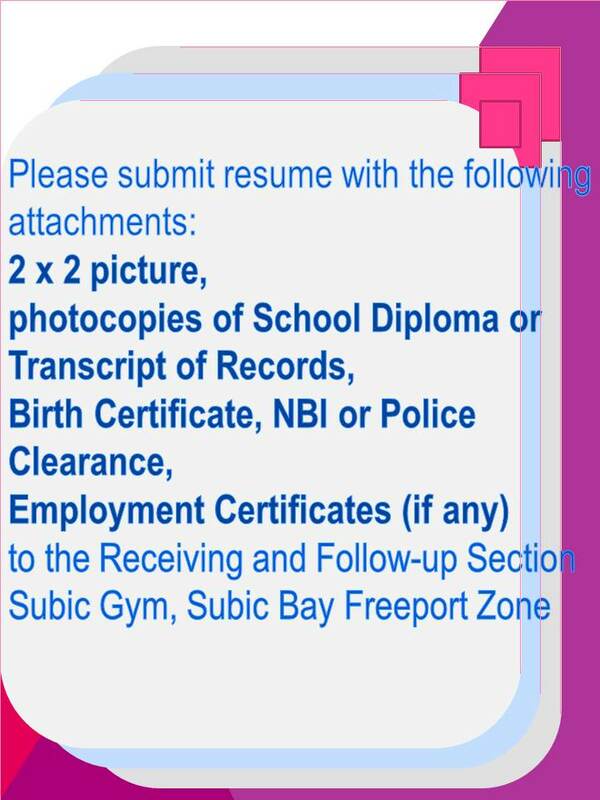 Male; Graduate of TESDA or Vocational School in Electrical Installation and Maintenance; With good moral character; Must be willing to work on shifting schedules; Can work extended hours and under pressure; At least 3 to 5 years of experience in industrial and construction jobs; Experience as A/C Technician is an advantage. Female; Preferably a graduate of any 4 year course; With experience of teaching English as a second language; Must possess excellent ENGLISH communication skills; Must be friendly and approachable and patient. Male; Preferably with barista experience / orientation or undergone comprehensive training / schooling; Willing to work opening or closing shift (Mall time schedule); With pleasing, flexible personality; Pro-active, Dynamic, Creative, Smart and can relate effectively with other customers; Proficient in oral and written communication; Willing to work overtime if needed. Male / Female; Must be a graduate of a 4 year course, preferably Psychology or Human Resource Management; With or without experience as Sewer/Tailor in a garment / apparel manufacturing industry; Admirable dexterity in operating industrial sewing machines; Physically fit to stand what the position requires; Resourceful, creative and hardworking; Able to operate machines with minimal supervision; Willing to work on extended hours and during holidays. Male / Female; At least Vocational graduate / College level; With experience in the same field is an advantage; Above average communication and coordination skills; Willing to work on extended hours and holidays when the need arises; Attentive to details. Male / Female; At least 1 year experience as Sewer / Tailor in a garment / apparel manufacturing industry; Admirable dexterity in operating industrial sewing machines; Physically fit to stand what the position requires; Resourceful, creative and hardworking; Able to operate machines with minimal supervision; Willing to work on extended hours and during holidays. Female; College level; Can speak mandarin and fluent in English; Proficient in MS Office applications; Can deal with all levels of people; Pleasant personality, confident and patient.